Cashew Urushi is made of Cashew oil, squeezing Cashew nut shell (see left). Cashew tree belongs to the family of sumac tree, Cashew urushi is very similar characteristic to Hon Urushi (made of Japanese sumac tree). Also, Cashew urushi does not have typical sumac tree rash (eruption of skin). 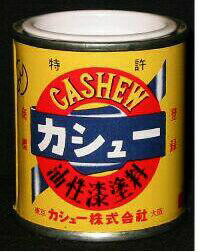 Cashew Co., Ltd. (Japan) invented and patented Cashew Urushi in 1950, and started delivering Cashew Urushi widely in Japan. 1. Easy to make swelling finish. 2. Easy to make flat surface due to higher surface tension. 3.Dryed surface is harder and higher elastic. 4. Water, chemical, solvent resistant. 5. Availability of many different colors. 1. Remove dust, oil, mold. 2. Remove cap and mix up paint well before use. 3. If paint is higher viscosity, add Cashew thinner. Clean-up and care: Use Cashew thinner to clean equipment. 2. Use with adequate ventilation. 3. Do not use near fire. 4. Use with certain protection, such as paint gloves, eye wear, dust mask (when use spray). 5. After painted, close container after each use, keep no direct sun light place. 6. 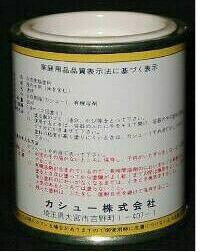 Harmful if swallowed due to contains organic solvent. Do not breathe vapors or spray mist. Ensure fresh air entry drying application and drying. If you experience eye watering, headaches, or dizziness, leave the area.